my umbrella shelters and shades. my playground delights all ages. my cradle cozies brand new wings. my camouflage keeps them safe. my roadways help build a city. I am a wild brush willow tree. Latham plays with words and poetic forms. For instance, her titles are colorful and fun. “Lifestyles of the Sleek and Sinuous” describes how the Black mamba snake lives while “Calling Carcass Control” explains the feeding habits of various animals. Many of the poems follow a traditional format with set stanzas and rhyme. Others are more creative. “Oxpecker Cleaning Service” is written as an advertisement while informing readers about this animal’s important role. To highlight the difficulty giraffes have to get a drink, a free verse poem is written in outline form. While the poems can be enjoyed for their diversity and delightful imagery, this collection has educational value as well. It can supplement units on Africa, habitats, and animals in the science curriculum. Sounds devices like rhyme and alliteration are plentiful. These poems can be used to study diverse voices and personification. The poems themselves are educational on their own. 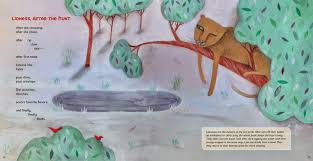 However, a short paragraph corresponds to each one providing additional background information for young readers to better understand the habitat and animals. This format can be an inspiration for poetry writing in the classroom or at home. First, provide an informative prose paragraph on an interesting topic or assign students to pick their own. Then, allow students to write poems using the information. Encourage them to play with literary devices like personification and point of view as well as sound devices. This activity is also an opportunity to teach the difference between poetry and prose. While prose just “gives the facts,” poetry allows readers to experience the facts through vivid imagery and different points of view. 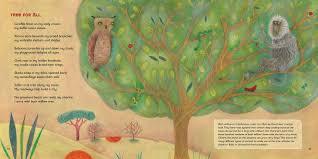 Anna Wadham’s illustrations are fantastic. 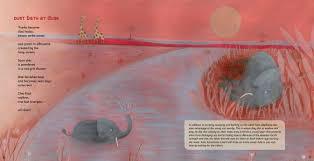 The soft colors and beautiful drawings give little glimpses into life on the African grasslands. Overall, Dear Wandering Wildebeest is a celebration of nature and diversity. It is a must-read! Isn't Irene's book wonderful? The artwork, poetry, and topic work together like a biome. Fridays aren't just for poetry. They are also the beginning of the Jewish Sabbath. Today, I'm baking challah bread and sharing a wonderful challah poem by my friend, the poet Dennis Kirschbaum. Thanks for hosting! Irene did a great job with that book; I remember reading it when it first came out a couple years ago, thinking my son would love it - and he does! Thanks for hosting and for the review of Irene's book. Thanks for hosting this week! 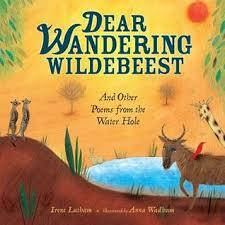 Dear Wandering Wildebeest is a delightful melding of words and pictures--great pick! Happy Poetry Friday! 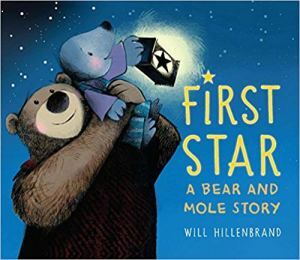 That is a wonderful book, and all my kids love it. It's fun, light, brave and bold all at once. :-) Thank you for hosting! Thank you for hosting, Poetry Friday. Irene's work is delightful. Thanks for hosting, and for this great review. I'll be keeping an eye out for this one. Thanks for hosting and for reminding us once again why we love Irene's book so much! What a lovely surprise to visit Roundup and find those wandering wildebeest looking back at me! Thanks for reading -- and for sharing! And welcome to Poetry Friday!! It is always a delight to have the author stop by. Thanks for sharing your lovely poems. Thanks for hosting, and sharing this wonderful book by Irene. It is such a wonderful celebration of that place. fun with the kiddos during my reading visits. Her way of sharing these great creatures is so inventive. Glad to see this title here. Thanks for hosting and for your informative review! This is a book that's on my wishlist twice--for myself and my grandkids. What a lovely review. Thanks for hosting today! Thank you for hosting, I have this book in my classroom and find all the learning via poetry fascinating. Great post featuring a wonderful book! So happy for Irene that it just won the Lee Bennett Hopkins/ILA Promising Poet Award. :0) Taking a little vacay/bloggie break this week, but I look forward to catching up on Poetry Friday in coming days - Thanks for hosting! Thank you for the reminder to revisit the wonderful Dear Wandering Wildebeest: And Other Poems from the Water Hole. What a lovely combination of vivid imagery and information--now I must take another look! Thank you for hosting and for highlighting Dear Wandering Wildebeest. Irene is a master at imagery and wordplay. My students and I love all of her books!